From the root folder > expand the 'Network' folder > Right-click on 'IPs' and select Add. From the root folder > expand the 'Network' folder > Right-click on 'Routes' and select Add. *To check everything is all setup and working okay at this stage; try a ping test from the NetScaler's CLI across the router to the remote Netscaler's WAN side IP – this should be successful! *At this stage start a ping test running from your endpoints! 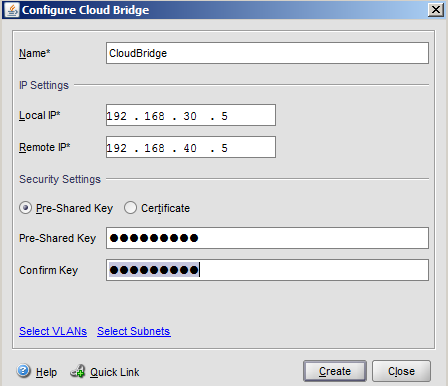 4) At the point of completing both Cloud Bridge configurations, we should have a succesful Cloud Bridge up and running! 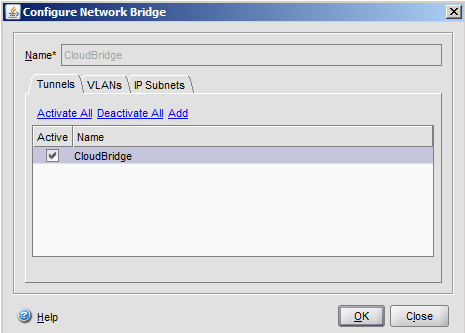 From the root folder > expand the 'Cloud Bridge' folder > click on 'Network Bridge' > right-click on the newly created CloudBridge and select Open. Simply un-ticking the 'Active' box and clicking OK, should stop the flow across the Cloud Bridge. 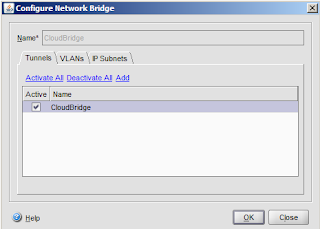 Some readers may question why I have not had to configure the VLANs or IP Subnets tabs for the Cloud Bridge in this lab (on neither NetScaler was the Default VLAN 1 enabled as Active, nor were any IP Subnets added into the configuration.) The answer (probably) lies in the existence of SNIPs for the 10.10.10.X network at either end. 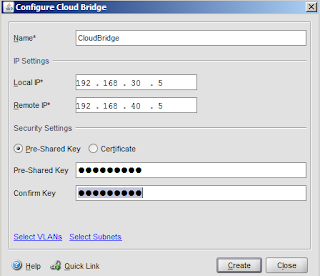 This lab is only intended as a Walkthrough guide to demonstrate getting Cloud Bridge up and running, and from a working model we can tinker around further to see what effect different options/configurations have on the Cloud Bridge. I've been trying to configure this today but not had any joy. However I am using version 10 and things are a little different. I can get the ping to work across the router to the opposite MIP but when it comes to setting up the bridge it where I am stuck. Any advice?